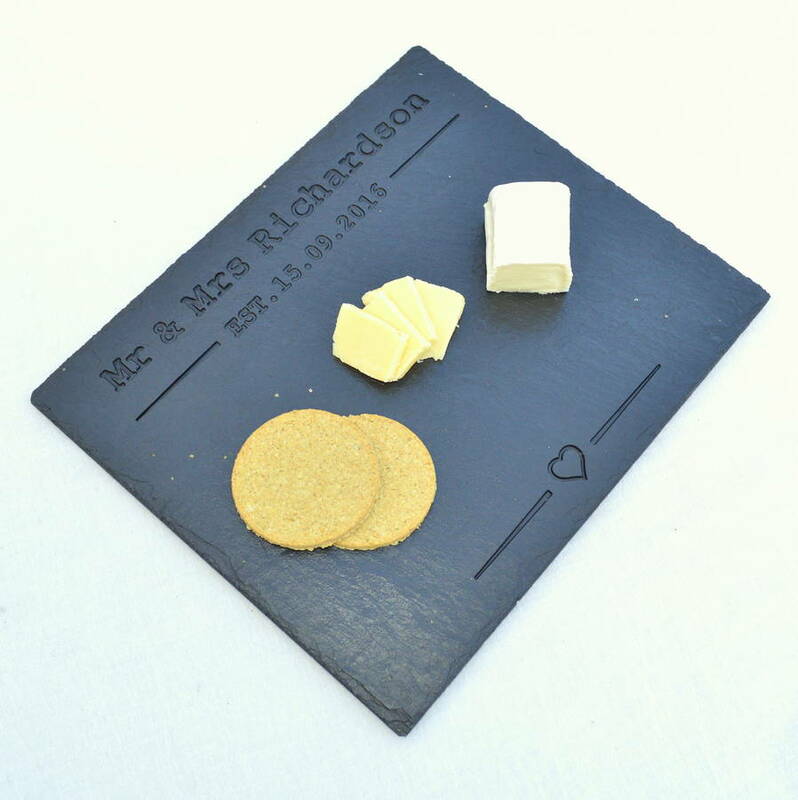 This elegant engraved slate cheese board makes a lovely personalised wedding gift or anniversary gift. Our personalised slate cheese board is designed and made in our own workshop in Derbyshire. You can add the names of your choice (up to 20 characters and spaces) and a date. For a wedding, civil partnership or anniversary, you may choose the happy couple's title, be it 'Mr & Mrs', 'Mrs & Mrs' or 'Mr & Mr', followed by their last name. You could also choose first names, for example 'Sarah & John' and then the date of your choice. We always engrave EST. If you want just the date, please send us a note when ordering. You could also choose a family name for the top line, for example 'The Taylor Family', to celebrate the creation of a new family or for a housewarming present. 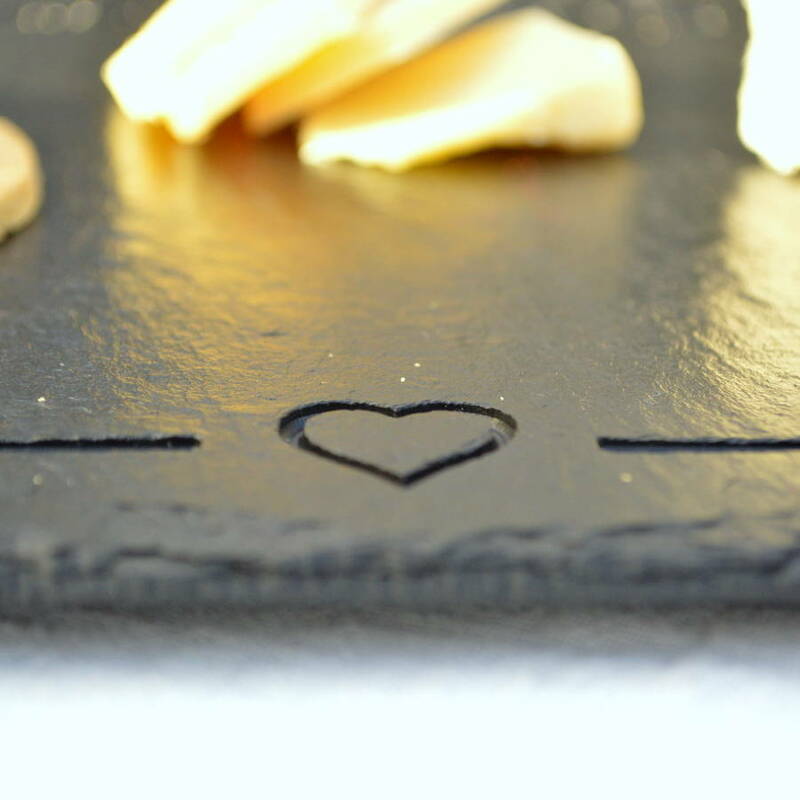 We cut each slate cheese board by hand and engrave it with your chosen words. We finish the platters with black feet to protect your furniture and also make the board easier to lift and move around the dinner table. 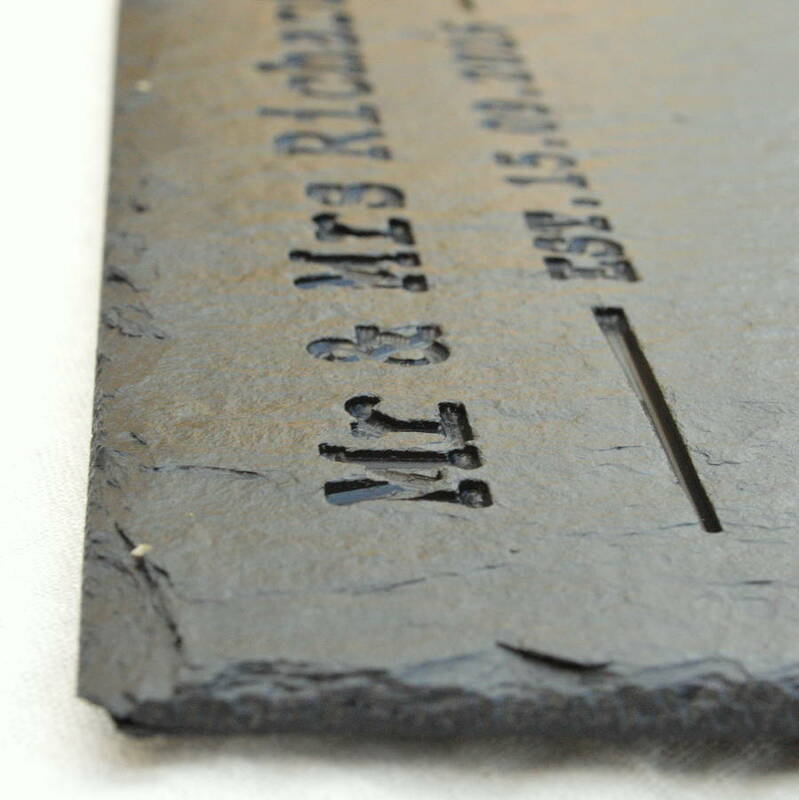 Once engraved, we apply a coating of food safe oil to seal the slate and give it a soft sheen. We wrap the slate cheese board in tissue and place it in a natural cardboard box so it is ready for you to giftwrap. Cheese and biscuits are not included. 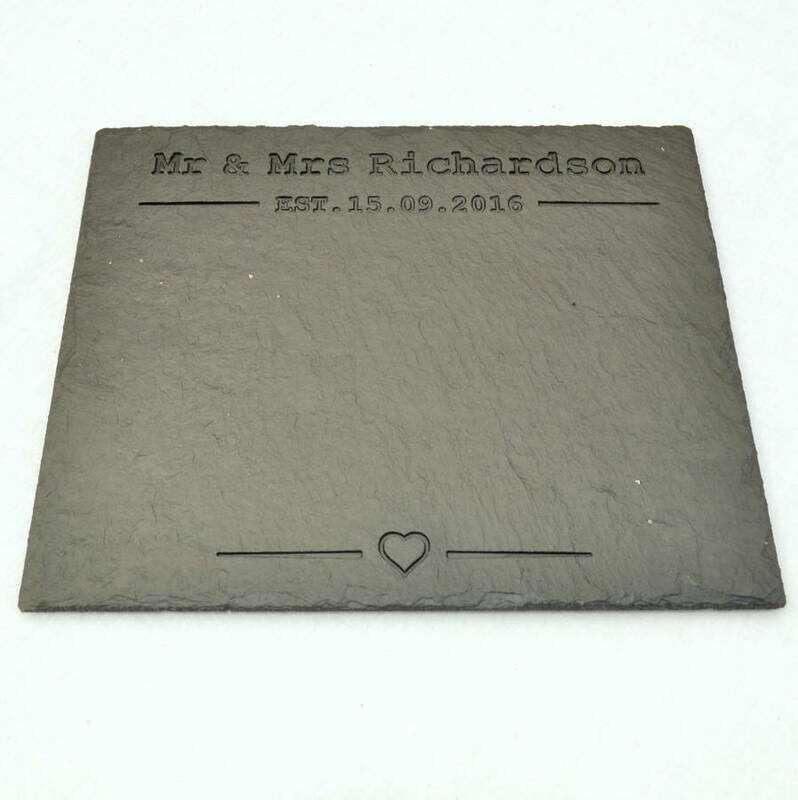 Each piece of slate is different in texture and may contain small pieces of pyrite (Fool's Gold) which is a naturally occurring mineral in the slate. 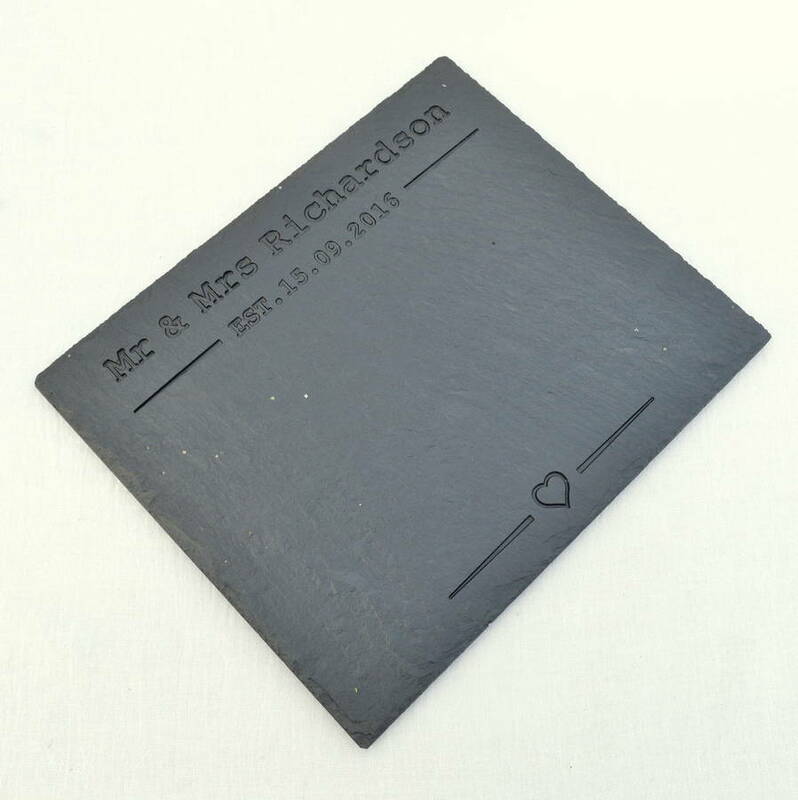 We only engrave pieces of slate we would be happy to receive ourselves. Being a natural product, no two pieces are the same, making each one truly unique. Wipe clean with a damp cloth. Do not immerse in water or put in a dishwasher. Apply a light coating of walnut oil or olive oil with to maintain the finish as required.